Leo Sayer (born Gerard Hugh Sayer, 21 May 1948) is a British-born singer-songwriter musician, and entertainer (now an Australian citizen and resident) whose singing career has spanned four decades. Sayer launched his career in the United Kingdom in the early 1970s, and became a top singles and album act on both sides of the Atlantic in the 1970s. His first seven hit singles in the United Kingdom all reached the Top 10 – a feat first registered by his first manager, Adam Faith. His songs have been sung by other notable artists, including Cliff Richard ("Dreaming"). Sayer was born to an English father and an Irish mother in Shoreham-by-Sea, Sussex, where he attended St Peter's Catholic Primary School. Later he attended Blessed Robert Southwell (now Chatsmore) in Goring-by-Sea. before studying commercial art and graphic design at West Sussex College of Art and Design in Worthing, Sussex. He was initially discovered by musician David Courtney, who then co-managed and co-produced him with former pop singer turned manager, Adam Faith. In January 1967, while 18-year-old Sayer was working as a hall porter at the King's Hotel in Hove, he assisted in the rescue of guests from a fire that damaged the first floor of the hotel. He was rescued by builders working on a block of flats beside the hotel. Sayer began his music career co writing songs with David Courtney, including "Giving It All Away", which gave Roger Daltrey of The Who his first solo hit in 1973. The same year, Sayer began his career as a recording artist under the management of Adam Faith, who signed Sayer to the Chrysalis label in the United Kingdom and Warner Bros. Records in the United States. 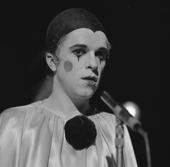 His debut single "Why Is Everybody Going Home" failed to chart, but he achieved national prominence in the United Kingdom with his second single, the music hall styled song "The Show Must Go On", which Sayer performed on British television, wearing a pierrot costume and makeup. The single went to #2 on the chart in the United Kingdom, as did his debut album Silverbird, co written with David Courtney, who co produced the album with Adam Faith. His subsequent singles were all major hits in the United Kingdom – "One Man Band" went to #6 in 1974, "Long Tall Glasses" (UK #4, 1974) became his first Top Ten hit in the United States, reaching #9, and "Moonlighting" went to #2 in the United Kingdom in 1975. In 1976, Sayer recorded three Beatles songs, "I Am the Walrus", "Let It Be" and "The Long and Winding Road" for the Beatles themed concept film, All This and World War II. His albums in this period were also consistently successful in the United Kingdom, and he scored five consecutive Top 10 placings on the United Kingdom album chart between 1973 and 1977. He also garnered success as an album artist in the United States, beginning with his second LP Just A Boy (1974), which reached #16. His fourth album Endless Flight (1976) consolidated his international popularity, reaching #4 in the United Kingdom and #10 in the United States; it also charted strongly in other countries including Sweden, Norway, the Netherlands and New Zealand, and was certified as a platinum album, in both the United Kingdom and the United States, and double-platinum in Canada. Sayer also made cover versions of Bobby Vee's Sonny Curtis/Jerry Allison composition, "More Than I Can Say" (his fourth UK #2 hit and US #2), and Buddy Holly's "Raining in My Heart" (1979) and "Orchard Road" in 1983. In the United States, three of his singles - "You Make Me Feel Like Dancing" (1977), "When I Need You" (1977) and "More Than I Can Say" (1980) - were certified gold. Sayer provided songs for the soundtrack of the French–Belgian animated film, The Missing Link (Le Chainon manquant) in 1980. In 1981, he voiced Dan the forest ranger in The Raccoons on Ice, the second of four specials serving as a predecessor to the Canadian animated series The Raccoons. He also sang several songs for the special, all of which were included on the 1983 album Lake Freeze. In 1990, he contributed to the last studio collaboration between Alan Parsons and Eric Woolfson, Woolfson's solo album Freudiana, performing "I Am A Mirror". Sayer performed at the Sanremo Music Festival in 1990, with "The Moth And The Flame" (English version of "Tu... sì" by Mango) and, in 1991, with "All Alone" (English version of "Dubbi No" by Mietta). After a decade of success, Sayer's career suffered repeated setbacks due to a series of financial and legal problems. When Sayer and his first wife Janice divorced in 1985 subsequent financial disclosure revealed Adam Faith had badly mishandled his business affairs, and that much of the millions of pounds he had earned over the previous decade had been lost, through Faith's questionable investments and business expenses. Sayer sued Faith for mismanagement; and the case was eventually settled out of court in 1992 with Sayer receiving a reported payout of £650,000. In the early 1990s his career stalled again while he fought a protracted but ultimately successful legal battle against his former label, Chrysalis, to regain the publishing rights to his songs. In 1996, Sayer was forced to sue his new management, after he discovered that his pension fund had allegedly been mismanaged to around £1 million. Despite spending more than £90,000 in legal fees the case never made it to court and Sayer was forced to abandon the suit for reasons of cost. He assembled a band led by former Van Morrison guitarist Ronnie Johnson and toured his way back to financial security. They recorded a live album, Live in London, which was released in 1999. On 12 February 2006, he made a return to number one in the UK Singles Chart, with Meck's remix of "Thunder In My Heart". It was his first appearance in the United Kingdom Top 10 for almost twenty four years, and his second chart topper in the United Kingdom, almost three decades after his first. Leo Sayer: At His Very Best, a career spanning compilation album, was released in the United Kingdom on 6 March 2006. It featured the Meck single, alongside "When I Need You" and "You Make Me Feel Like Dancing". In June 2008, Sayer released a new album only in Australia, Don't Wait Until Tomorrow. This album, produced by Garth Porter (from the Australian pop band Sherbet), and released by Universal Music Australia, featured selections from his catalogue re-arranged with strings and acoustic and jazz instrumentation. In January 2009, Sayer became an Australian citizen, having lived in Sydney, New South Wales since 2005. Sayer has appeared in various television shows including The Muppet Show (1978's Episode 3.02 on which he sang "You Make Me Feel Like Dancing", "The Show Must Go On", and "When I Need You"); The Wiggles 2008 DVD, You Make Me Feel Like Dancing, which featured Sayer's hit of the same name; Celebrity Big Brother UK in 2007; and the Australian television comedy, Stupid, Stupid Man. In the episode "Days of Wine and D'oh'ses" of the television series The Simpsons, a character mentions Sayer as being another singer he likes, after Elvis Presley. In January 2015, Sayer released his latest album, Restless Years, and toured from Perth across many places in Australia to Singapore, with various support acts including Jason Ayres. In January 2015, Leo also featured in Singapore's Leo Sayer in Concert - 40 Years at the Top, presented by the British Theatre Playhouse. Sayer and his wife Janice married in 1973, and divorced in 1985. He then had a relationship with Donatella Piccinetti, with whom he moved to live in Australia, but they separated in 2007. In 2009, Sayer became an Australian citizen at the Australia Day Citizenship Ceremony in Canberra. Sayer has been diagnosed with Irritable bowel syndrome, and underwent colonoscopy in 2013, after having suffered stomach and bowel problems for an extended period of time. The examination revealed the edge of a tumour, which was excised following a two-and-a-half-hour surgery. The doctor had identified two ulcers in the singer's intestine, one of which had become cancerous. The doctor explained that had Sayer waited any longer, the cancer would have posed a serious danger. Sayer has, since the procedure, changed his dietary lifestyle and avoids alcohol, caffeine and foods containing spicy ingredients—another reason being that both his parents had died of cancer, his mother of bowel cancer and his father of lung cancer. ^ Stephen Thomas Erlewine. "Leo Sayer: Biography". Allmusic. Retrieved 16 September 2013. ^ a b c Roberts, David (2006). British Hit Singles & Albums (19th ed.). London: Guinness World Records Limited. p. 483. ISBN 1-904994-10-5. ^ "What I learnt at school: Leo Sayer". Teachsecondary.com. Retrieved 16 April 2015. ^ "Leo's Story – So Far…". Leo Sayer.com. 21 May 1948. Retrieved 16 April 2015. ^ "Bedford Hotel, King's Road: Fire at the hotel". Mybrightonandhove.org. Retrieved 16 September 2013. ^ a b Roberts, David (2001). British Hit Singles (14th ed.). London: Guinness World Records Limited. p. 46. ISBN 0-85156-156-X. ^ "Eric Woolfson's FREUDIANA — The Musical". Ericwoolfsonmusic.com. Retrieved 29 May 2008. ^ Mark Anstead. "Fame and fortune: Singer who lost control of his notes". The Guardian. Retrieved 16 April 2015. ^ "At His Very Best — Leo Sayer — Songs, Reviews, Credits, Awards". Allmusic. Retrieved 3 October 2014. ^ "Leo Sayer: nostalgia tours are 'depressing'". 23 November 2008. Retrieved 11 November 2016. ^ "Seventies singer Leo Sayer becomes an Australian citizen". The Daily Telegraph. London, UK. 26 January 2009. Retrieved 3 October 2014. ^ Paul Cashmere (13 December 2014). "Sample Leo Sayer's 2015 Album Restless Years". Noise11.com. Retrieved 26 March 2015. ^ "Perth Acoustic Singer Songwriter Solo". Jasonayres.com. 21 November 2014. Retrieved 26 March 2015. ^ "Leo Sayer profile". nndb.com. 15 February 2007. Retrieved 24 February 2015. ^ Mark Anstead (20 November 2004). "Fame and fortune: Singer who lost control of his notes". The Guardian. Retrieved 24 February 2015. ^ "Leo Sayer says it's still so". Heraldsun.com.au. Retrieved 24 February 2015. ^ Dan Harrison. "Leo Sayer: pop icon becomes Australian citizen". Smh.com.au. Retrieved 24 February 2015. ^ Webber, Richard. "Leo Sayer on the colonoscopy that gave him a lifesaving early warning for cancer". Daily Mirror. Retrieved 20 January 2016. ^ "Leo Sayer: Artist". Official Charts. Retrieved 30 December 2011. All pre-1990 albums: Kent, David (1993). Australian Chart Book 1970–1992. Australian Chart Book. Restless Years: "ARIA Australian Top 50 Albums". ARIA. Retrieved 30 January 2015. ^ "Discografie Leo Sayer". DutchCharts.nl. Retrieved 11 October 2011. ^ "Discography Leo Sayer". norwegiancharts.com. Retrieved 11 October 2011. ^ Steffen Hung. "Discography Leo Sayer". charts.org.nz. Retrieved 30 December 2011. ^ "Discography Leo Sayer". SwedishCharts.com. Retrieved 11 October 2011. ^ "Lero Sayer : Chart History". Billboard.com. Retrieved 16 September 2013. ^ a b c d e f g h i j k l m n o p "Certified Awards Search Archived 24 September 2009 at the Wayback Machine.". British Phonographic Industry. Retrieved on 27 September 2011. Note: User needs to enter "Leo Sayer" in the "Search" field, "Artist" in the "Search by" field and click the "Go" button. Select "More info" next to the relevant entry to see full certification history. ^ a b c d "Searchable Database". Recording Industry Association of America. Retrieved 27 September 2011. Note: User must define 'Artist' search parameter as "Leo Sayer". ^ "Certified Awards Search Archived 1 October 2012 at WebCite". Music Canada. Retrieved on 27 September 2011. Note: User needs to enter "Leo Sayer" in the "Search" field, "Artist" in the "Search by" field and click the "Go" button. Select "More info" next to the relevant entry to see full certification history. ^ "Musiikkituottajat - Tilastot - Kulta- ja platinalevyt". Ifpi.fi. Retrieved 16 April 2015. ^ Cashmere, Paul (13 December 2014). "Sample Leo Sayer's 2015 Album Restless Years". Noise11. Retrieved 30 January 2015.